Hi All they do you guys know were you can get new o-ring for the drive flange and inside of the final drive cause I can't see any at Cyclemax I only see the bearing kit (T41-6260/P0215-0017) which i was going to order. You could check partzilla.com for OEM parts. You can find them on the Cyclemax site also but you have to look in the OEM section. They have the fiche there for all the parts. Also Western Honda is a good place to find your OEM parts. Actually, I have never replaced the ones on my bike. It doesn't look like it would be hard to do. Here is a link to a how-to on removing the rear wheel which has some pictures of those o-rings and where they are located. It might be of some help to you. Go to item #39 in this link and you will see the pictures of them. Yes bellboy I seen it before thank just that the picture does not show how difficult it might be or not. On my next tire change my bike be close to or have over 100 thousand mile on the bike so I'm going to change All the O-ring and bearing and the Universal joint and hope to be GOOD for the next 100 thousand mile. cause wife does not let me get the new 1800 cause they don't make it color GREEN. "They don't make it in the color Green" ? That is the flimsiest excuse I have ever heard from a wife. Surely, she's more creative than that ! Worse than that.....you bought it ? I just realized you appear to have exactly the same bike as mine. 1997 SE Pearl Sonoma Green, I think it is called. Yeah, women seem to really like that color. I've gotten many comments from them at bike rallies and such over the years. It is a really nice color. Probably the best "green" color they ever came out with. Ha! I remember, and my wife often reminds me, that I told her when I got my first street bike, a Honda CB550, that it was the largest bike I would ever need. Then came the CB750, then a GL1000, then a GL1100, then a GL1200LTD, then a GL1500 and now two GL1500s. Ok I'm shopping for ALL my read wheel stuff so I can have ALL the part I'm going to need when i remove back wheel. Here is the confusion on DIY how to remove back wheel on pic.#43 it say NOT to grease or lubricate the 5 pin type flange but on our Goldwing ser. manual chapter #15 page14(15-14) the pic say and show to grease(lub)the 5 pin. This is very confuse. Yeah that want I say about getting the 1800 wife say the I say if I get the 1500 after I let go the GL1100 I will not ask for other bake I was hoping she forgot. . I see where you saw that on chapter 15, page 14. But, on the following pages, there is no mention of it, even where they say to grease the flange splines. My recollection is NOT to grease those pins. There would seem to be no reason for it, as the only movement desired at that point is the rubber dampers. Movement of the pins would only serve to elongate the damper sleeves, which ruins them. I suspect that may be one of those service manual errors, as there are a few. That is correct, you do not grease the 5-Pin flange pin. The 1988 and 1989 6-Pin flanges needed to be greased and the OEM manual mistakenly left the grease note in the newer manuals. By the way, the O-Ring is very easy to replace. The flange O_Ring is 91358-MG9-003. There is also an O-Ring on the wheel as well as the drive flange. That O-Ring is 91302-MA6-003. It too is easy to replace. As to ordering parts, if yo are going to replace the U-Joint, you certainly will have to remove the final drive. While you have it off, be certain you grease the drive line output splines and the final drive input shaft cup splines. You will need some Moly grease to do that. Also, don't forget to buy a new seal for that area. OIL SEAL (27X43X7), part number 91261-ME9-005. The splines should be greased about every 16,000 miles according to a Tech Bulletin that Honda put out many years ago. You can see the damaged seal on the drive line near the splines in the first picture. I am sure the damaged seal is what led to the splines drying out and failing. Mine failed at 92,000 miles and was covered under warranty, but that was in 2002 when the warranty was still in effect. Here is some more information about lubing the drive splines and flange pins. This was from some information from Honda that Stu Oltman got and passed it along. It seems we are NOT to put the Moly lube on the 5 pin flanges even though they left it in the service manual, apparently in error. We at GWRRA continually strive to improve our relationship with American Honda, and our efforts have recently been rewarded with improved communication between your Technical Editor and Honda’s Service and Service Publications divisions. In fact, we now possess service literature for every model of Gold Wing ever produced. In addition, we’ve been placed on the subscription list for the Honda Motorcycle Technician Newsletter otherwise known as “The Wrench.” This should be a tremendous benefit to Wing World readers, as the technical information in our pages is more likely than before to be correct and up-to-date. As I unwrapped the packet of newsletters dating from 1995 to 2002, I couldn’t help browsing as I separated the various year packets and placed them into the binder. Suddenly, an article on final drive spline lubrication caught my eye. I feel this information is important, so this month’s column is dedicated to sharing it. The first article I noted in the January 1997 “Wrench” is titled “GL1200/GL1500 Final Drive Flange Lubrication.” It instructs technicians to lubricate the final driven flange pins and splines on all GL1200s and ’88 and ’89 GL1500s with Pro Honda Moly 60 whenever the rear wheel is removed for any reason but not to exceed an interval of 16,000 miles. For GL1500s with the 5-pin flange (1990 and later), the letter indicates that the pins do not require lubrication. The second article, a follow-up that appears in the February “Wrench,” states that application of Moly grease to the 5-pin flange may actually accelerate wear, because the steel pins are mated with aluminum collars (as opposed to the steel collars used with the 6-pin flange). Got that? No grease on the pins of GL1500 5-pin flanges. Late model GL1500 manuals delete text references to lubing the pins, yet the drawing accompanying the text continues to indicate that lube is required. Why the confusion? My guess is that the drawing, taken from the 1990 service manual, was mistakenly retained unaltered through the 2000 edition. Might there be a connection between some mechanics being unaware of this lubrication update and some of the letters to Wing World’s “Workbench” from Wingers who have had their drive shaft splines fail? Though the service manual instructs us to lube the final driven flange at each wheel removal, there hasn’t been any other reference to lubing the driveshaft splines in any GL1500 service manual except during R&R of the final drive gear case. Curiously, the 1984 to 1987 GL1200 service manual does indeed call for drive shaft and pinion spline lube at 16,000 mile intervals—but for the ’84 to ’86 models only. We think it’s important that owners and mechanics who have been unaware of the two sentences quoted above from an easily overlooked maintenance procedure update that appeared six years ago be informed or reminded of it. The GL1500 Gold Wing is going to be around for a long time, and mechanics and owners should be aware of this information to keep our machines in top form. Armed with this knowledge, getting the required maintenance performed is as easy as doing it yourself or asking your mechanic to do it according to Honda’s recommendations that you now know. Again, we want to thank American Honda for making this information available. 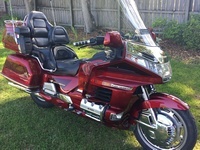 The owner/operators of Honda’s flagship luxury touring motorcycle have always been extremely interested in giving their machines the best in care. Anything we at GWRRA can do to help our Members accomplish this effort, including reading the fine print in some old technical update newsletters, is time well spent. Thank Mike I have ALWAYS remove my shaft and grease it every tire change my is excellent condition I'm doing the U-joint wheel bearing O-ring and so on cause the back wheel is about to get 100 thousand miles. WingAdmin. did a DIY on the U-joint and he said you don't have to remove the final drive only remove left side lock nut and pivot bolt.
" These sentences apply to all GL1500 service manuals after 1997. “Also lubricate the pinion and drive shaft splines at this [16,000 mile] service. Heavily loaded GLs may require more frequent lubrication.” "
I don't think I'm familiar with these items. Could someone point me in the correct direction ? I think they are referring to the items that MikeB posted.... those worn out and rusted splines. This is a picture of the worn unlubricated Pinion Joint that was removed from My 1999 GL1500 with 94390 miles, July 2002. This is a picture of the worn unlubricated Drive shaft Splines from my 1999. I didn't know that it was called a Pinion Joint until I looked it up in both the service and parts manuals. So, I assume these are located on the Final Drive end of the drive shaft ? The other splines that need to be lubricated are on the Engine end of the drive shaft ? I haven't done mine yet, but it's coming up soon. If one was to include the splines on both ends of the drive line then there would actually be three sets accessible of splines to lubricate with when the wheel and final drive are removed. The set that is most talked about are the splines on the wheel drive coupler, that would be one set; the pinion joint and mating drive line end would be the second set; and the forward end of the drive line that goes into the universal joint would be the third set. They should all be lubed with Moly lube. They guys we talk about every think in the back wheel BUT we or nobody talk about the SWING ARM BEARING? don't we also have to remove the swing arm and lube this bearing after so many thousand miles or tire changes.